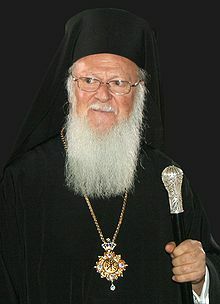 Bartholomew I is the Ecumenical Patriarch, “first among equals” in the Eastern Orthodox Church and spiritual leader of hundreds of millions of Orthodox Christians worldwide. He lives in Istanbul, once Constantinople, along with his remaining flock, a few thousand Greek Orthodox Christians. By all accounts, his situation is quite precarious; he has, for example, been the target of numerous assassination plots by Muslim extremists. Today, Bartholomew appeared before a Turkish parliamentary subcommittee that is preparing a new constitution for Turkey. He made a plea for religious freedom and equality. He requested that Halki Greek Orthodox Seminary, closed by the government since the 1980s, be reopened; that freedom of worship be protected; and that state funding be available for minority as well as Muslim communities. Although the present Turkish constitution guarantees religious freedom, members of minority religions often complain that their rights are not honored in practice. “Unfortunately there have been injustices toward minorities until now,” Bartholomew said. “These are slowly being corrected and changed. A new Turkey is being born.” We shall see.